Anyways, so Father's Day is tomorrow and my pops is a huge fan of key lime anything - especially pie. Nothing says "I love you, Pops" like squeezing 70000000000 key limes, crunching up graham crackers and making what I discovered is quite possibly the easiest pie to make from scratch ever. We're heading to my sister's house tomorrow for a celebration and smorgasbord of deliciousness, so I'll definitely be posting the recipe if it's a winner. 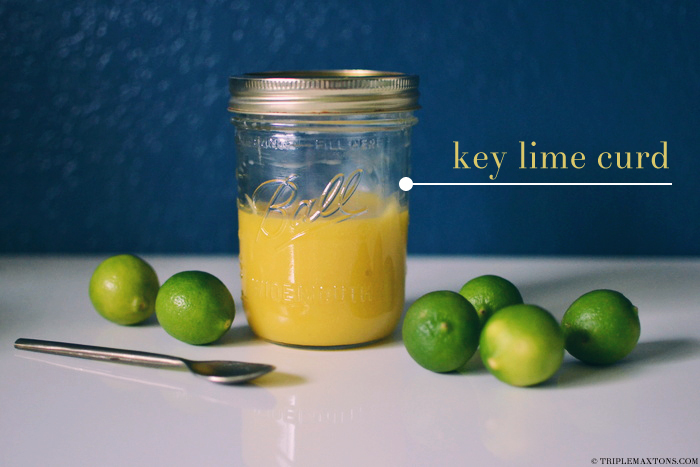 I had a bit of leftover juice after making the pie, so I decided to make key lime curd. Seriously, guys...it's like crack. SO good. Drizzle it over scones, meringues (more on that later too...can you tell I've been baking like a madwoman today? ), or ice cream. I love that it only takes 4 ingredients to make, too. Easy peasy with gourmet flavors. That's my kind of recipe....click the link below for the full how-to! 1. In a non-reactive saucepan, whisk the eggs and sugar until well blended. Whisk in the key lime juice. Place the pan over medium-low heat. 2. Cook, stirring or whisking constantly, until the mixture is warmed through. Be careful not to heat the mixture too quickly to avoid curdling the eggs. 3. Whisk in the butter a little bit at a time, stirring in each addition until completely incorporated before adding more. 4. Continue to cook, scraping the bottom of the pan, until the mixture thickens and a spoon or spatula leaves a path when drawn through it. Immediately remove the pan from the heat and pass the mixture through a fine mesh strainer. 5. Transfer to an airtight container and refrigerate. Refrigerate up to 2 weeks...but I'd be shocked if it lasted that long. I made my dad a Father's Day pie too! This curd sounds absolutely phenomenal. That curd sounds awesome and excited to hear about your new jobby job. This looks delicious. I love making key lime pie but for the one I make I use key lime juice. I think I need to try this route-with fresh key limes.